FM is getting serious as there is cash prize involved. 5k for the winner of the Creators Cup. This was the Carabo Cup Final vs Chelsea. Full Time and Extra Time ended 1-1. It was on penalties when Pool was leaving 2-1 with Jordan Henderson next to take to kick and crashed. This deleted my CL 1st Knock Out Stage 1st Leg 5-0 away win at Porto! First time it crashed was when the game was still at 18.1.2. The aftermax of the FM crash. I still managed to win 2-0 1st leg away at Porto but lost the Carabo Cup Final 3-2 in extra time to Chelsea. Luckily, the immediate next match is the EPL match at Stamford Bridge and my Pool managed to do a double over them. Facing a big problem now!!! My Wolves finished 6th in the second season and qualified for UEL. Board gave me 66m transfer kitty. Players on transfer list: Chiesa Federico, Lozano Hirving, Leroy Sane, Andre Gomes, Vietto Luciano. Problem is ... None wants to join my club! and Mancity just bidded 69m for Reben Neves. Instantly put 100m and 30m in installments. Hope it will put them off. Last edited by ItsmeagainhK; 29-11-2017 at 07:42 AM..
Orh yeah. I encountered 3rd crash in my current save game and still only season 1. Non of you experienced any crashes? Last edited by cct75; 29-11-2017 at 04:54 PM..
Nope but occasionally face those really terrible lag. Don't remember crashing ever since beta finished. The thing is I am running on a monthly rolling saving over the same saved game. I just had to reload the same saved game and it just went pass the "crashed" stage. Now, I switch to weekly save. Anyone know how to promote staff? I'm trying to promote a coach to HOYD role. Offer him a contract. If you are lucky, he might be willing to take dual role. That midfield partnership of Wendel and Aurthur. Scary! I was updating all the stadium and citypics for my FM17 and boy there look gorgeous!! 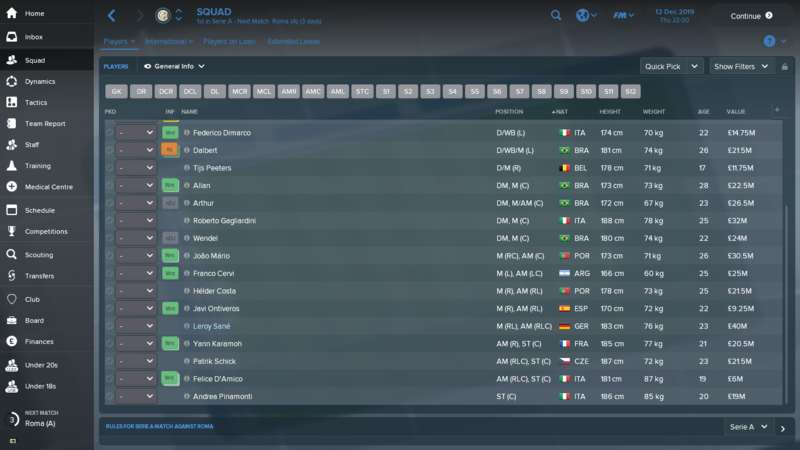 I don't really use them together, Arthur pair with Gagliardini, Wendel and Allan as back up. Wendel is decent but needs time to improve more.